File photo of Barsapara Stadium, Guwahati. 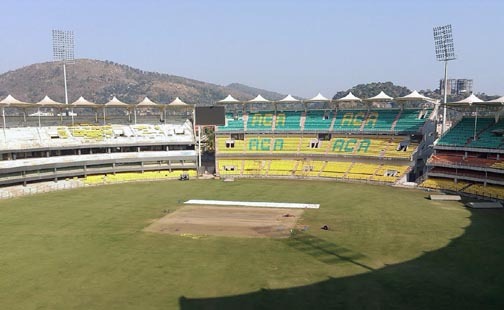 In what can be termed as a major disappointment for cricket lovers of Guwahati, Barsapara stadium has failed to get any matches of the upcoming edition of the Indian Premier League (IPL). The cricket enthusiasts were particularly excited because it was reported last year that franchisees like Rajasthan Royals and Kings XI Punjab were looking at Barsapara as a venue to host some of their home matches. Officials of Rajasthan Royals had even visited Barsapara and expressed satisfaction regarding the facilities. It is still unknown why Guwahati has been deprived. The Barsapara stadium has been praised for its world class facilities and last year it had successfully organized an international T-20 match between India and Australia. However, the unfortunate incident of few youths pelting stones on the team bus of the visiting Australians tarnished the image of the organizers. Sujit Chowdhury, Assistant Secretary, Assam Cricket Association (ACA), refused to admit that the stone pelting incident was the reason behind Barasapara being deprived of IPL matches. “The stone pelting incident is definitely not the reason we didn’t get any matches. It is entirely the prerogative of the franchisees. Due to some reason, they might have decided not to host their matches here. Last year, officials of Rajasthan Royals visited the stadium and they expressed satisfaction on the facilities and showed interest to host three of their home matches in the city. We hope to get matches in the future,”he told Northeast Now. Former first class cricketer from Assam, Syed Zakaria Zuffri, expressing his disappointment said that the IPL matches would have given the budding cricketers of the state a chance to learn by watching the greats of the game from close quarters. “However, we should not lose hope. Cities like Ranchi and Indore have been given IPL matches in the past though they don’t have a home team. The fact that our budding player like Riyan Parag was included in the auction is another good sign,” he said. Mriganka Sekhar Chanda, a resident of Kahilipara and a cricket enthusiast however opines that though the ground facilities is good in Barsapara, some issues are yet to be sorted. ” I am disappointed because Barsapara truly is a world class stadium and is capable of hosting international matches regularly. However, there a are few issues that the organizers need to fix. The parking is inadequate which creates a lot of chaos. As day-night games finish late, transportation for fans become a problem as well. Maybe, these were the reasons why we didn’t get any matches this time,” he said.